It feels good to be recognized for your hard work, doesn't it? Our students demonstrated exceptional performance on this year's National Latin Exam and National Spanish Exam! These exams test knowledge of grammar, vocabulary, and culture through listening and reading comprehension and are taken by middle and high school students across the Anglophone world. Four of our middle school Latin students received perfect scores on the Intro Latin exam, putting them in the top 2% of over 140,000 test-takers. 28% of test-takers received ribbons denoting their placement in the 90th percentile or above. 100% of our Latin I exam test-takers received medals, including two gold medals, awarded to students scoring 90% and above. BASIS Independent Brooklyn had the most perfect scores of any other school in Brooklyn! Only a handful of schools across the nation receive multiple perfect scores, according to the National Latin Exam organization, making our students’ success all the more extraordinary. 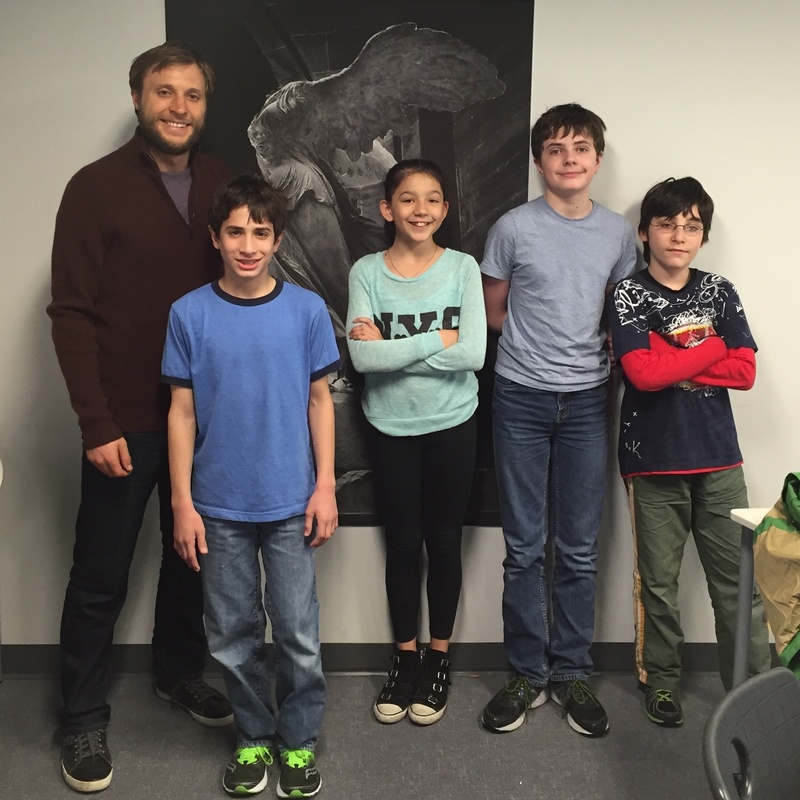 As a reminder, all BASIS Independent Brooklyn 5th and 6th graders take Latin. In 7th grade and above, students have the choice of a mandatory foreign language class. They choose between Latin, French, Spanish, and Mandarin. 8 students taking our Spanish elective took the exam. 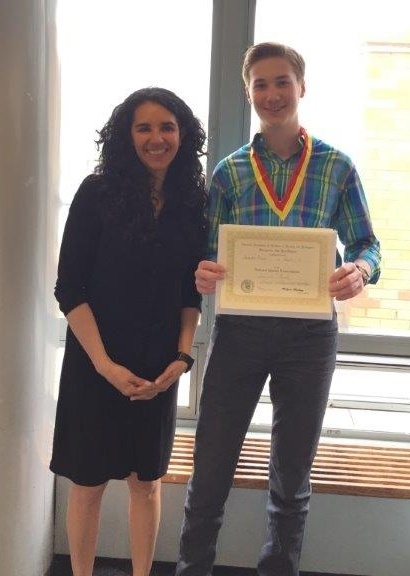 One 9th grade student received the prestigious Gold Medal, and placed in the 99th percentile of all test-takers worldwide, making him eligible to apply for the Global Citizen Scholarships. In just the first year of our Spanish program at BASIS Independent Brooklyn, we can't wait to see the number of students who opt-in to study the language increase. We know there is more "gold" in our future! Just think - all of this success on exams where the majority of test-takers worldwide are in high school and significantly older than our students. (From L-R) Mr. Kaiserski and his perfect Latin scholars - Jared M., Camila C., Benjamin H., and Max V.. And Ms. Arzate with Gold Medal winner, Sam L., at the NSE Awards Ceremony. Reflecting on our students' awesome success, Benjamin H., a 7th grader who joined BASIS Independent Brooklyn in its inaugural year and achieved a perfect score, loves that Latin helps him "build connections between the past and the present, and improve [his] understanding of other subjects. It's really logical... and so it's easy to enjoy the class." In many ways, foreign language classes, in particular Latin, are "lightbulb moment" classes. Students learn more about their own command of the English language and witness the interconnectedness and influence of language in the other disciplines, particularly the sciences and history classes. Sam L., a 9th grade student in Ms. Arzate's Spanish elective who scored in the 99th percentile of all test-takers worldwide, attributes his success to lots of practice and the pragmatic approach of our language teachers. Sam appreciates that Ms. Arzate's class takes a "broad approach, rather than getting bogged down in heavy grammar and vocabulary early on. It really encourages you to make sentences and use Spanish, and I try to practice as much as I can at home. We have homework, but I really just try to use Spanish as much as possible." We couldn’t be more proud of the achievements of our young "discipuli" and "estudiantes" and know that this success is only the beginning for them. Hungry to read more on our amazing student achievements? Check out our blogs covering 8th graders Kimora and Kristen on their win at the Scholastic Art & Writing Awards as well as this year's middle school Model U.N. win.